But what to do when you have only a short amount of time to spend at Disneyland, for whatever reason? It’s true, we could have spent a lot longer than two days at Disneyland and there was so much more to see! However, we’re here to tell you that even two days can be just as magical as a longer trip, so long as you make the most of it. Here’s how to squeeze the most juice out of a two day trip to Disneyland and how we ticked off (almost) everything on my Disneyland bucket list in just two days. Doing it this way meant that we could walk right into the park without having to queue up to buy tickets at the gate. This saved us LOADS of time. We strongly recommend the second option. The park hopper ticket, whilst the most expensive option, allows you to move more fluidly between Disneyland and California Adventure. Whenever either park got extremely crowded, we just hopped over to the other one and back again. This meant we could get onto rides faster, which in turn allowed us to squeeze more rides in. We had initially intended to spend one full day at either park. The first day was going to be entirely at Disneyland and the second at California Adventure. 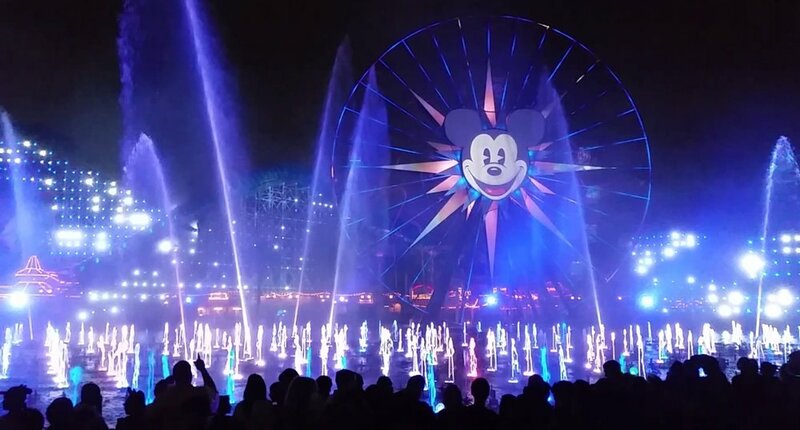 However, once we got into Disneyland and checked the park schedule, the fireworks at Disneyland weren’t on until the following evening, and World of Color at California Adventure were on that Monday. The park hopper allowed for a simple solution. We spent the day at Disneyland then wandered over to DCA in the afternoon for World of Color. The following day we hit up DCA in the morning and then drifted to Disneyland in the afternoon for the fireworks. We visited on October 19 and 20. It was about a week out from Halloween, so it was probably a little bit quieter than that time of year would otherwise be, but not as crazy as the actual week of Halloween. Yet, we still got to see all the Halloween decorations and theming. Attendance is typically lower mid-September to mid-November. Greg and I were up with the sparrows (I was too excited to sleep) on our Disneyland days. Rather than spend money and waste valuable time queuing and eating breakfast in the park, we took advantage of the free continental breakfast offered at our hotel. We were at Disneyland at 8 am the first day and at DCA for its opening at 10 am the second day. Not only could we pretty much walk right to the front of the bag check line, but the park was much quieter and we had a better chance of walking right onto rides. This was especially true for DCA. The day before, we had wanted to ride Tower of Terror but at 3 pm the queue was over an hour long. First thing in the morning, we hardly waited 20 minutes. We settled on a strict (and sometimes painful) rule before we walked into the park. The rule was that if we had to wait more than 45 minutes for a ride we had to walk away. We could come back later and check again but any more than 45 minutes was a deal breaker, otherwise we would spend too long waiting and have to sacrifice other attractions at the park. (At the time, we knew nothing of FastPasses.) This meant that I had to sacrifice Indiana Jones and Haunted Mansion, but each of those rides would have chewed up well over an hour. I wouldn’t have been able to do nearly as much had I stood in line waiting for them. We woke up early (at about 7, I’d been awake since 6). After we took advantage of our hotel’s continental breakfast, we hopped in a cab and high tailed it to Disneyland. We reached the gates right on opening. There was no line at the bag check and we’d already bought our tickets, so we could walk right in. We wandered through Main Street and had a poke around the Disneyland Story (we didn’t enter the Hall of Presidents). Greg couldn’t keep me away from Sleeping Beauty’s Castle any longer: we got several photos here (after I shed a little tear). We wandered through the castle into Fantasyland. Most of the rides were overcrowded, including King Arthur’s Carousel and Dumbo, but the Mad Hatter’s Tea Party had little to no wait. I crossed the purple teacup right off my bucket list! It’s A Small World was closed for refurbishment (gutted! ), so we made our way straight to Mickey’s Toontown. There was only a 15 minute ride for Roger Rabbit’s Car Toon Spin, so we jumped aboard at once. We passed through Mickey’s Toontown into Frontierland. We did a bit of shopping for the nieces and nephews at Pioneer Mercantile and Silver Spur Supplies. After Greg impressed me with his shooting skills at Frontierland Shootin’ Exposition, we walked straight onto the Mark Twain Riverboat without any queues. After disembarking from the Mark Twain, we headed to Critter Country. Splash Mountain’s wait time was only 20 minutes and it felt like even less. This was about the time it really sunk in that I was actually at Disneyland. I may have shed another tear. From there, we headed back toward New Orleans Square. The Haunted Mansion queue was over an hour, so it was out for now. I consoled myself with a churro. The good news? The wait time for Pirates of the Caribbean was just on 45 minutes, so we queued up. This was the longest we waited for a ride (apart from Space Mountain). So worth it though! We then made our way through Adventureland. This was super crowded. Indiana Jones was over an hour, so I couldn’t get on it. We headed back to Main Street for some sustenance: two hot dogs and a Mickey pretzel. By this stage, the park was getting heavily crowded. We abandoned ship and headed over to Disney California Adventure as we planned to see World of Color in the evening. DCA was less crowded, although we couldn’t get on Tower of Terror or Soarin’ for the lines, so we amused ourselves at Buena Vista Street with some shopping. We headed over to Mickey’s Fun Wheel late afternoon. This one actually had a sizeable line: upwards of 30 minutes. We spent the whole ride talking to a young couple who tipped us off about priority seating for World of Color. Thanks, guys! Greg created a diversion and went off to surprise me with tickets at Ariel’s Grotto for a dining package so we could watch World of Color. We ate a beautiful honeymoon dinner on the water overlooking Paradise Pier. After dinner, we wandered down to our front row seating as we watched the spectacular World of Color aquatic light show. I let Greg sleep in a little longer this morning. I was up at 7. Disney California Adventure was on the roster this morning and it doesn’t open until later, about 10 am. We had breakfast at the hotel and jumped in the cab. Our cab driver this morning took advantage of our tourist status and tried to take us on a “shortcut” – but once the cab fare climbed beyond what we’d paid for our trip yesterday, we knew we’d been had. We ended up in the staff car park and asked him to let us out. We detoured through Downtown Disney before reaching Disney California Adventure. The bag check was a wee bit longer this time, but still quite short. We headed into California Adventure. We don’t get Pumpkin Spice Lattes in Australia so I had to try one at Starbucks on Buena Vista Street. The park was all but dead – nobody was about. The queue for Tower of Terror was only 30 minutes so we jumped aboard. This was easily my favorite ride! We explored Cars Land (the Radiator Springs Racers were down) and then wandered through Pacific Wharf to Paradise Pier. We could walk right on to Ariel’s Undersea Adventure, so we jumped onto that and then went exploring Redwood Creek Challenge Trail at Grizzly Peak, followed by Grizzly River Run. This was only a 20 minute wait. We made our way back to Paradise Pier, we rode Goofy’s Flying School Roller Coaster and the Silly Symphony Swings – we could just about walk straight on to both of these. Greg tried his very best to convince me to ride the California Screamin’ Coaster. However, I don’t do loop-the-loops so I was having none of it. He gave up eventually, rode it himself and loved it. We made our way to Disneyland Park and rode the Disneyland Railroad to Tomorrowland. We disembarked and checked It’s A Small World – still down for maintenance. This and Haunted Mansion were the only things I didn’t get to check off my Disneyland bucket list! Space Mountain only had a 30 minute wait advertised so we eagerly hopped in line. Space Mountain chewed up more time than we expected – the ride broke down while we were in the queue so we spent an hour waiting to get on. This was the longest we waited in line for a ride the whole trip. This may seem long, but the wait for the D.C. Rivals Coaster at Movie World can be well over an hour on a quiet day, so it’s nothing to us Aussies. On the way back from Tomorrowland we rode the Matterhorn – we did wait a little while for this one, about 30 minutes. We got chatting to a nice family from Texas so the time sped by. We headed back through Fantasyland to Frontierland to ride the Big Thunder Mountain Railroad. By this stage, our bellies were starving so we headed back toward Main Street where we ordered a corn dog each. We sat at the Carnation Cafe to eat it. We stuck pretty close to Main Street after that as the Soundsational Parade was about to start. The wait paid off: we grabbed a great spot to watch the show! After watching the parade, we headed back to Adventureland. The Jungle River Cruise was much quieter yesterday, so we climbed aboard and cracked up laughing the entire ride. Heading back through Main Street, we went out to Downtown Disney for a shop at the Disney Store. I wanted a jumper and some Mickey ears. We also wanted to scope Downtown Disney to see if any restaurants were available for dinner. Word to the wise: if you want to dine at Downtown Disney, you have to book well in advance. We, unfortunately, did not do this and nobody had a seat available until 8 pm. It would have meant missing out on the fireworks, which was a non-negotiable so we gave it a miss. We headed back to Disneyland and grabbed a seat for the fireworks right in the front row. We had to sacrifice a bit of night time park exploration for this prime spot. Greg couldn’t leave Disneyland without saying goodbye to the Mark Twain, so he left me where I was to ride it one last time. We watched Paint the Night and the special Disneyland Forever fireworks right after that. There are fireworks, and then there are Disneyland fireworks. We still watch our video of that display all the time. It was one of the highlights of our whole honeymoon. Having sacrificed dinner at Downtown Disney, we emerged late at night with hungry guts and found something to eat right outside Disneyland at Captain Kidd’s. For $10.99 we gorged our bellies with a bit of everything from the buffet and crashed, exhausted and joyful, in the cab. It was a whirlwind 48 hours at Disneyland. We did miss a few things here and there, and we had to be ruthless in our sacrifice at times in order to be able to maximize our time, but overall we were able to get around both parks and see and do most of the things, if not all of them, in two days. Whether you’re there for two days or two weeks, Disneyland provides magic at every turn. Half the beauty of it is that there’s always more to see, something new to explore. No matter how long we’d have stayed for, I think we still would have left wanting more. That’s just the magic of the mouse.